Disclosure: Chobani provided me with the yogurt as part of their tailgating recipes #MadewithChobani promotion. However; as always, all opinions are my own. Check out their recipes section for more ideas on how to incorporate Greek yogurt in your cooking. It's football season and that means it's time for tailgating and game-day eats. Full disclosure, I'm not a huge football fan, but my husband and a lot of our friends and family are big sports fans. I prefer to supply and eat the goodies! While you are out there tailgating with your friends before the big game, don't forget to include something sweet to end your feast. These fudgy brownies are made with Chobani Greek yogurt so they are a slightly lighter treat to indulge in. Greek yogurt provides the brownies with a nice dense and fudge-like texture without the eggs and butter in most brownie recipes. I used non-fat yogurt and you can't tell at all. The yogurt gives these brownies a distinctive and pleasant tang that compliments the sweetness well. 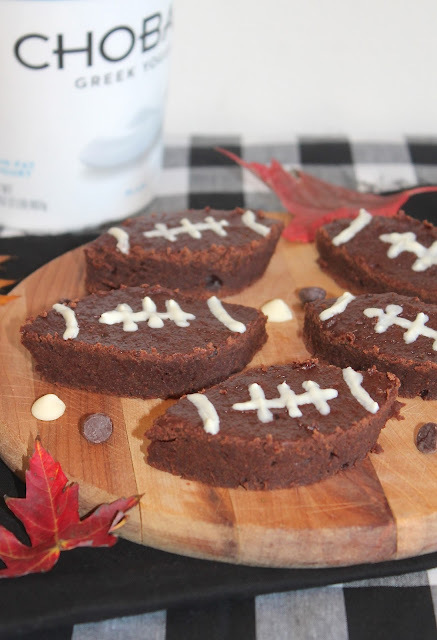 This recipe will make about 10 football-shaped brownies (and you'll have plenty of scrap pieces to nibble on while you are decorating them). These are a perfect little treat for your next tailgate or game-day gathering and everyone will love their fun football shape! Apple fritters have long been one of my favorite doughnuts (just behind the peanut stick really). I will admit though that we rarely eat doughnuts and through my whole life they were more of a treat than a regular thing (and that's probably a good thing and how it should be). 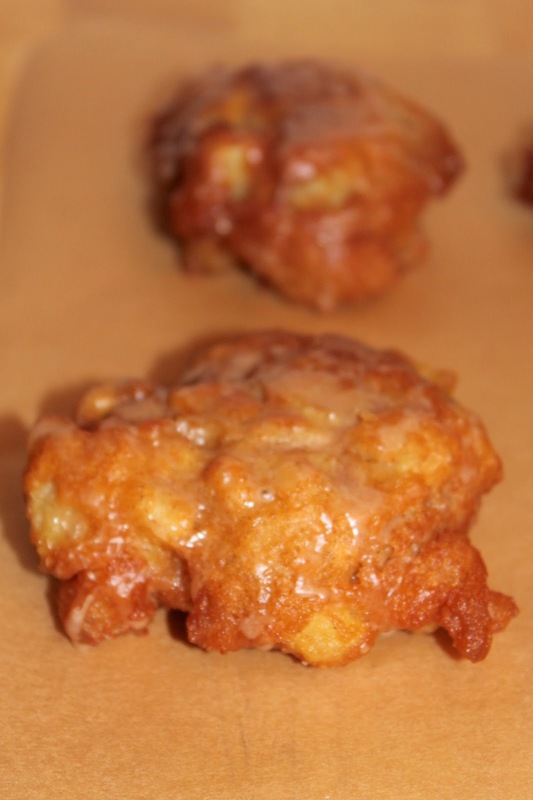 In my quest to try and make more apple recipes though, fritters have been on that list for a while now. Now I can happily check them off! 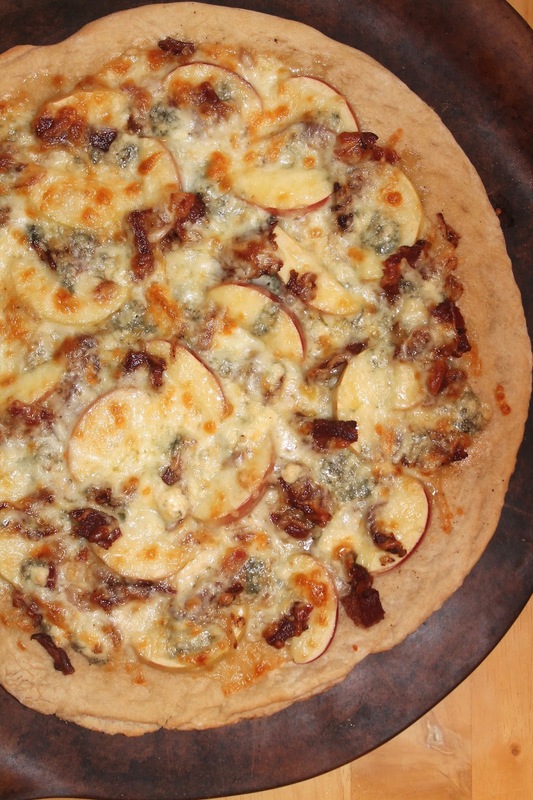 Apple picking always inspires me to use apples in new ways each autumn. Golden fritters that are crisp on the outside and soft on the inside and filled with fresh apple chunks, apple cider, spices, and then topped with an apple cider-spiced glaze. I mean, come on! Who can resist??!! I made these fritters on a Sunday night to eat while we watched some Halloween specials. They were a perfect treat with a cup of decaf coffee! I slightly adapted these from a recipe I found over at The Pajama Chef. I made a few minor changes and my batch ended up making 10 fritters. One big change I made was cutting back on the glaze -- I think there was still more than enough. Apple fritters aren't the most pretty thing to look at or photograph, but they are super tasty!! These fritters are best enjoyed on the first day. Leftovers can be kept in an airtight container, but they won't be as crisp the next day. Mulligatawny soup is something I've been intrigued about since the Soup Nazi episode of Seinfeld many years ago. I recently decided it was time to do a little research and give this intriguing sounding soup a try. I learned that Mulligatawny is an English soup based on an Indian soup. 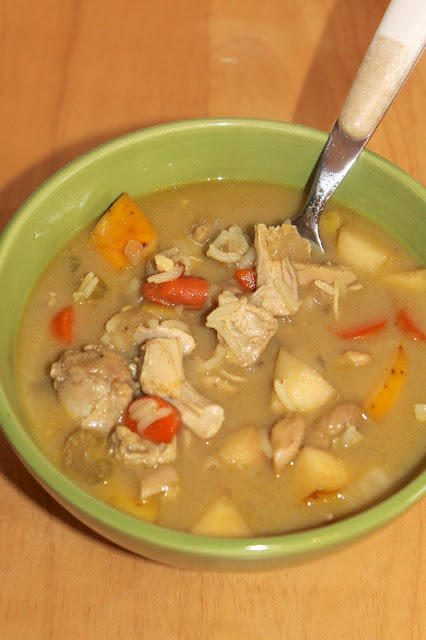 I read a lot of recipes and not one was the same... some used chicken, some used lentils, some used cream, some used coconut milk... but a lot of the basics were the same - onions, carrots, celery, apples, curry powder, bay, and something creamy. The soup turned our terrific. My only complaint is that it was terrible to photograph. All the apples floated to the top and all the other stuff fell to the bottom. So, it just looks like a curry broth of apples! But trust me, there are a lot of other goodies hiding and swimming below the rich curried broth. This is a soup absolutely fit for a chilly fall or winter evening. It will serve about four people. This is a recipe for all of the lucky folks out there who have the ability to get their hands on some pawpaws in the fall. We only discovered the pawpaw a few years ago after I heard a piece on NPR and kinda became obsessed with finding them. Lo and behold, we found them a few weeks later sitting in a box at one the our favorite farmer's stands at our local farmers' market. To this day, this is still the only place we've found them, even though they are a native fruit to our region. If you live in the region where pawpaws are native, I highly suggest seeking them out. They have a short season and are rarely found in grocery stores. They are also called "custard apple", "poor man's banana", and other names. Once you smell and taste one you will be very surprised that they grow in the mid-West and mid-Atlantic region of the U.S. because you will swear you are eating a tropical fruit -- custardy and sweet with a taste and smell like a cross between a pineapple, banana, apple, and mango. If you want to learn more about the pawpaw, check out this book - I'm currently reading it and it's really fascinating so far. We pretty much always just enjoy our pawpaws raw and out-of-hand (well, spoon). But this year I decided I wanted to try a recipe with them and decided on a simple tart. This tart has very few ingredients and no spices -- it's all about the flavor and texture and smell of the pawpaw. This recipe will make one 9-inch tart. Now that we have an abundance of apples from apple picking last weekend, I'm going to try to be using them up in all sorts of new ways as I do every year. Sure, we eat plenty out of hand and I can some applesauce (and sometimes apple butter), but coming up with new recipes to incorporate our apples is part of the fun. This year we took our copy of Apples of Uncommon Character: Heirlooms, Modern Classics, and Little-known Wonders into the orchard with us. I adore this book and have been looking forward to taking it apple picking with us since it came out last year. We go to LynOaken Farms where they have an orchard with well over one hundred heritage apple varieties growing, in addition to all the classics. It's amazing to step back into the past and bite into these apples with names like Moonlight, Old Fashioned Limbertwig, Hidden Rose, White Winter Pearmain, Crow's Egg, and so many more. I dream of owning an apple orchard sometimes, or at the very least having a nice little collection of trees in my yard. This year I knew I wanted to incorporate apple into a pizza and bacon, blue cheese, cheddar, and caramelized shallots all seemed to make sense to pair with a crisp, sweet apple. It was an experiment that worked perfectly. This recipe will make one pizza. Well it's now officially fall for me because we have gone apple picking. Apple picking at Lynoaken Farms has become an early October tradition since my husband and I got married. We go with a bunch of family members from both sides of our family and it's always a good time. Another part of this tradition is that I always bring a post-picking treat for everyone. This year I went with these chocolate chip pumpkin cookies. I was inspired by a recipe from the amazing Sally of Sally's Baking Addiction for these cookies. I only changed it up a little. 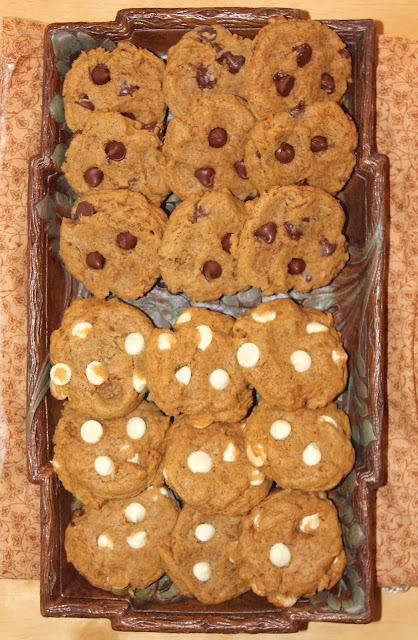 I doubled the below recipe and put semi-sweet chocolate chips in one batch and white chocolate chips in the other batch. I was pleasantly surprised at how much I enjoyed the ones with the white chocolate in them. They really complimented the pumpkin flavor and didn't overwhelm it. Even my mom who was resistant to try those claiming she didn't like white chocolate, also agreed after reluctantly giving one a try (and then a couple more). Don't get me wrong, the semi-sweet chocolate ones were also delicious, but I highly recommend giving the white chocolate a try. I love the tip from Sally to press in a few extra chips into the top of cookies after taking them out of the oven. It really makes them look a lot prettier! 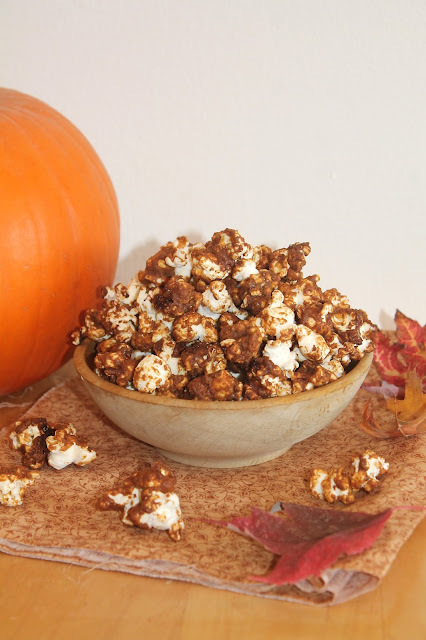 I've made them a couple times now and they are best enjoyed a day after they are baked so that the pumpkin and spice flavors really come through. This recipe will make about 2 dozen cookies.